The Prevent Peers programme was a series of Prevent training sessions which provided 15 hours of training per participant per local authority. It was delivered from October 2009 to March 2010 and involved 8 local authorities within the West Midlands region. Faith leaders, elected members and officers received training on a range of cohesion and Prevent related issues which are raised within the report. The findings list the outcomes of the programme and e-mail and telephony support was also provided to participants throughout the course of the programme. 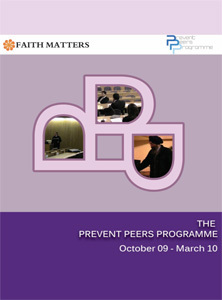 This work therefore outlines the Prevent training that Faith Matters can provide to other bodies.